The INNER WHEEL CLUB OF KALOOKAN CENTRAL, District 380 conducted a forum on the rights of women, gender equality and women’s empowerment in order to create awareness to abuses committed against them. The discussion was anchored on Philippine law enacted on March 8, 2004, Republic Act 9262, otherwise known as “Anti-Violence Against Women and their Children Act of 2004”. A well known lawyer, Atty. Lorna Patajo-Kapunan expounded on the provisions of the law, selecting topics which were timely to present situations and applicable to the audience. Participants were multi-sectoral: health workers, barangay officials, public school teacher, businesswomen and mothers from the community. 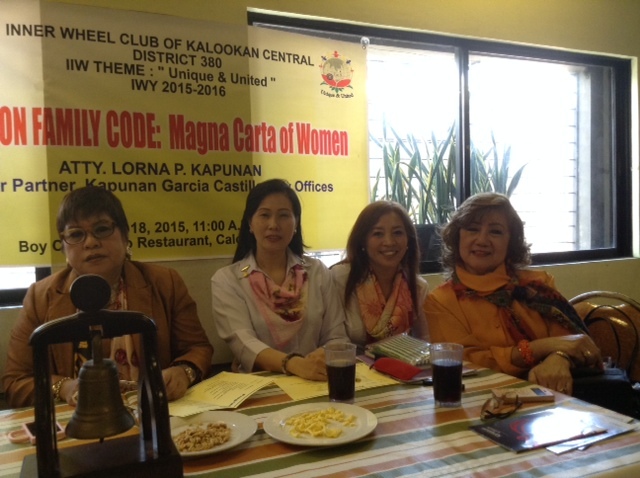 In attendance also were the National officers of Inner Wheel Club of the Philippines. This was held last August 18, 2015 at Caloocan City, Philippines. In an open forum that followed after the lecture, the participants actively asked clarifications on either their own predicaments or citing other people’s concern. 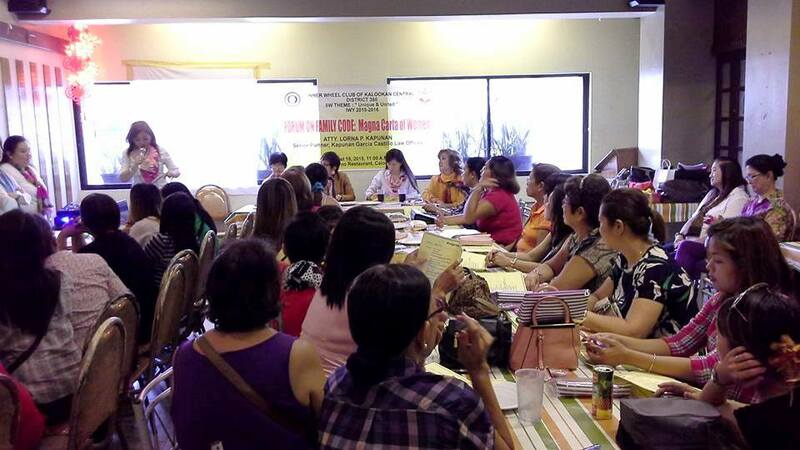 The session was an eye opener to Filipino women on their rights in order to protect themselves and their children from abuse, which could take the forms of physical, sexual, psychological or economic in nature. Primers published by United Nations were distributed to further equip the participants with reference materials.